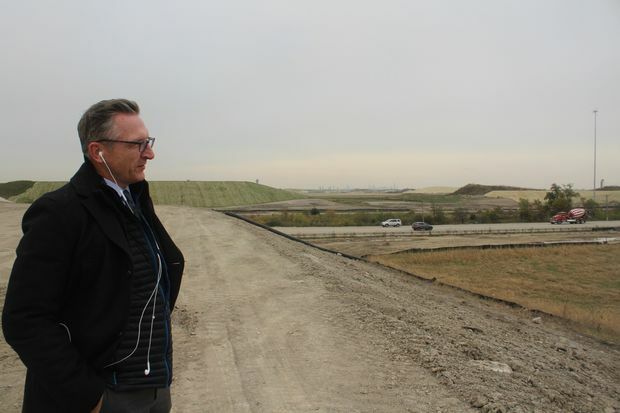 Construction corridor manager Pete Stukas shows where a new expressway will cross York Road in suburban Bensenville, ultimately allowing drivers to get into the airport from the west. 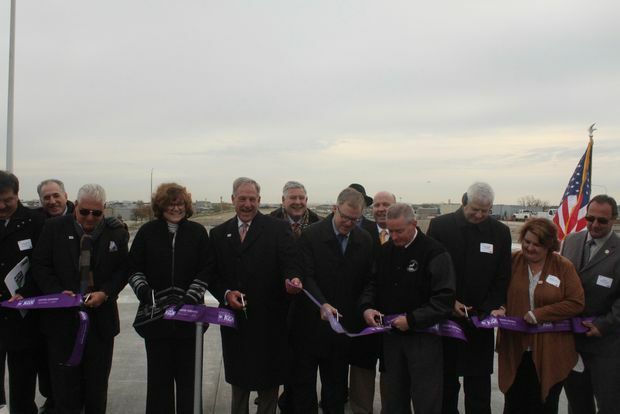 BENSENVILLE — City and county officials opened a 10-mile stretch of highway west of O'Hare Airport Wednesday, catapulting forward a $3.4 billion project that promises to one day let drivers enter the airport from the west. The new expressway network is projected to link to the O'Hare ring road by 2022, shifting millions of travelers away from the crowded Kennedy and Interstate 190 expressways, according to Illinois Tollway board chairman Bob Schillerstrom. "We envision that with western access ... the million people who live in DuPage County and half million who live in Kane County will be able to come in, park on the west side and get to the airport via a people-mover," Schillerstrom said. "So common sense would be that if it's easier for you to get in on the west ... this will reduce congestion on the east side." By the time the entire effort — dubbed the Elgin O’Hare Western Access Project — finishes in 2025, a new north-south expressway will connect Interstate 294 in Elmhurst to the Jane Addams (I-90) Tollway in Elk Grove Village, completing a ring of highways around the entire 7,200-acre airport. The stretch opened Wednesday extends Interstate-390 as far east as Busse Road in Bensenville, running 10 miles of continuous expressway from suburban Hanover Park to just west of the airport. The highway is expected to shave about seven minutes off travel times from one end to the other, officials said. Engineers have been planning to open a west driveway into the airport since 2003, when the DuPage County Board demanded the project in exchange for signing off on the O'Hare Modernization Plan, a decadeslong effort to reconfigure and lengthen runways in the airport. "There had been a political issue where the suburbs were tired of dealing with all the plane noise, while the city was getting all the economic benefit," Schillerstrom said. "So they made a deal allowing the [O'Hare Modernization Plan] to move forward in exchange for western access." The state's Transportation Department started planning the project with the aid of a $150 million federal grant, but in 2011 the job was turned over to the driver-funded Illinois Tollway. By the time the new highway network is completed in the middle of the next decade, it will represent "the largest infrastructure project in the Midwest," Schillerstrom said. Funneling more traffic through the western suburbs already has spurred development along the new corridor, but officials also expect the new route to be a boon to the city, according to Ginger Evans, commissioner of the city's Aviation Department. As the airport builds new runways and gates to boost its volume of daily flights, surrounding communities will have to make room for the added traffic, Evans said at Wednesday's ribbon-cutting ceremony. "The City of Chicago has always been a strong supporter of western access, because like O'Hare, it provides numerous benefits to the region," Evans said. "These improvements to the surrounding highways will strengthen Chicago's and O'Hare's desirability as an origin and destination site."